This Infographic comes from understory which showcases the 12 of the dirtiest corporate tax dodgers: Bank of America, Citi, JPMorgan, Wells Fargo, Chevron, BP, Shell, Exxon, Massey Energy, Alpha Natural Resources, Peabody Energy and Arch Coal. These 12 banks, oil and coal companies are responsible for foreclosing on millions of people’s homes and polluting our air, water and climate. At the same time, we found that they pay next to nothing into a tax system that provides the very services that protect the homeless, the sick and our environment. As the graphic below shows, banks, oil and coal companies are making billions in profits annually and paying much less than their fair share in taxes. In fact, the top four oil companies in the country made $1.26 trillion in gross revenues and paid a shocking 2.04% average tax rate. 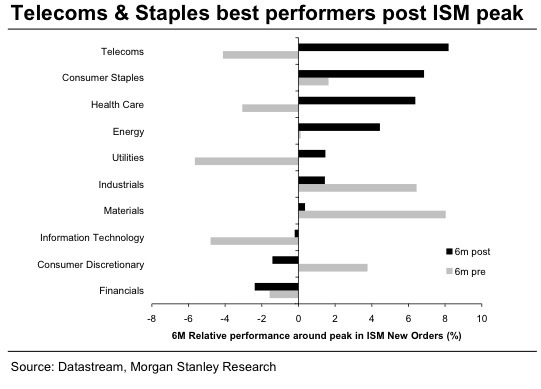 In a new note, Morgan Stanley's European team is getting defensive, and telling clients to go underweight industrial stocks and overweight the traditionally defensive telecom sector. 1) History suggests that defensive outperform post peaks in lead indicators and at the start of a new interest rate cycle. 2) Defensive sectors are very unpopular - European investors are now more underweight defensive than financials. 3) Over the last 40 years the only prior occasion when defensives had underperformed as much on a two-year rolling basis was in the 2000 TMT bubble. 4) Post poor performance, defensive valuations look increasingly attractive. To fund our more positive view on defensive, we are going underweight Industrials as we believe the sector is one of the most vulnerable to an inflection point in the economic growth story and is relatively more exposed to building margin pressures.